The archipelago of Raja Ampat, literally translated as Four Kings, is a remote frontier region in the province of West Papua. The area lacks what most would consider basic essentials - medical care, western consumer items, electricity. Access to banks and ATMs are scarce to non-existent and English is not widely spoken. The archipelago is part of the area known as the Bird's Head Seascape and also contains Cenderawasih Bay, the largest marine national park in Indonesia, where you can dive with a resident colony of whale sharks. According to Conservation International, marine surveys suggest that the diversity of marine life in this region is the highest recorded on earth with over 1,300 species of coral reef fish, 600 species of hard coral (75% of the world's total) and some 57 species of mantis shrimp. Relatively high sea surface temperatures suggest that the area may be resistant to coral bleaching and disease. The Bird's Head also has green and hawksbill turtle rookeries, the world's largest Pacific Leatherback Turtle nesting beaches, as well as whale and dolphin aggregations. Conservation initiatives are in place to develop effective, sustainable coastal and marine resource management that conserves biodiversity whilst benefiting the local communities. Diving is the main source of tourism in Raja Ampat. Raja Ampat is not an easy travel destination. A visit to this as yet untouched jewel is both an adventure and a privilege. Raja Ampat is located off the north west tip of the island of New Guinea in the province of West Papua (formerly known as Irian Jaya). Raja Ampat consists of over 1,500 small islands, cays and shoals surrounding the four main islands of Misool, Salawati, Batanta and Waigeo. The area covers more than 40,000 square kilometres of land and sea. Strands of coral reef, mangroves, sea grass beds and white sandy beaches surround the islands. Some of the islands are quite mountainous with cliffs extending 500 to 900 metres upwards. The topside of the islands are known for their raw beauty and bird life. The karst forests contain rare orchids, birds of paradise, tree kangaroos and many varieties of birdlife. The enchanting beauty of Raja Ampat's natural landscape and breathtaking scenery is unmatched. Everywhere you look you will be amazed by the perfect harmony between the green islands and the multi-hued turquoise waters. Getting there: The town of Sorong in West Papua is the main gateway to Raja Ampat. Sorong is mainly accessed via connections from Jakarta, Denpasar and Makassar. The underwater world is the main drawcard for a visit. Scuba dive or snorkel amongst the blue water mangroves, sea grass beds or over magnificent coral reefs. 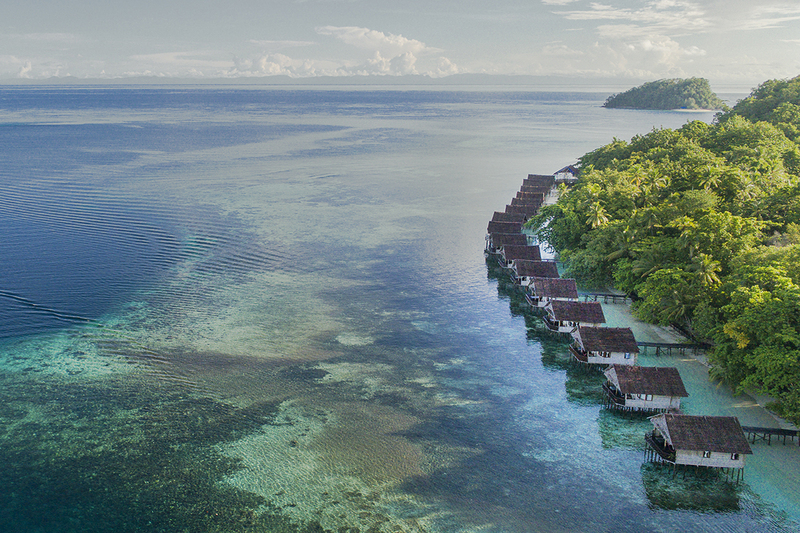 There is much to do on top of the water in Raja Ampat as well. The islands' ornate landscapes harbour a biodiversity as rich as that of the oceans. The tropical karst forests shelter birds of paradise, rare orchids, cuscus, tree kangaroos and countless other forms of terrestrial life which may be sighted during a jungle trek for wildlife and bird spotting. Cultural heritage sites range from World War II bunkers to stone relics of bygone kingdoms to ancient burial caves and galleries of neolithic cave paintings and shell middens. Raja Ampat's maze of islets, peninsulas, bays and inlets provides amazing sea kayaking opportunities for all skill and fitness levels. Glide silently amongst the spectacular islands and experience nature at its beautiful best. Or simply just kick back and relax in a hammock on a pristine, white sand beach. Raja Ampat lies on the equator and has a hot and humid tropical climate. The air temperature is fairly contant year round and can drop to 24°C overnight whilst the daytime maximum is 31°C. The average humidity is 83%. There is less chance of rain during the Northwest Monsoon between October and April. Although this season sees the least rainfall, Raja Ampat's heaviest rain usually falls in December and January, leading to those months often being referred to as a second wet season. The Southeast Monsoon occurs between May and September and delivers the bulk of Raja Ampat's annual rainfall. June and July are historically the wettest months. Rainfall is often short lived and localised. Southeast trade winds blow from May to November. The middle of the wet season (Mid-June to mid-September) can see some days with strong Southeast winds which can make sea conditions less pleasant. Sea travel in smaller boats can be problematic in June, July and August. The diving season is year-round. 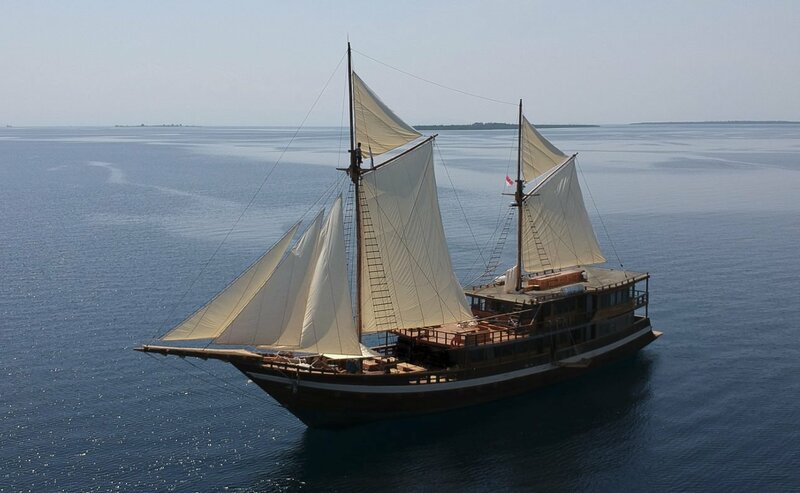 Most liveaboards avoid Raja Ampat from mid July - mid September due to the likelihood of experiencing both strong winds / surface swells and rain. Water temperatures range from 27-30°C and visibility can be from 10-30 metres with December to March having the best overall visibility. Microclimates do occur throughout the islands leading to variations of the above. The whale sharks reside in Cenderwasih Bay year round. However, around the time of full moon (+/- 4 days) and at times of festivals and celebrations when the local fishermen do not engage in fishing activities, it is unlikely to see the whale sharks under the Fish Platform area. Diversity is the key word for Raja Ampat - diversity of species and diversity of dive sites. The number of known dive sites is greater than 200 and exploration is still underway! Raja Ampat has it all - drift dives, muck dives, clear water mangroves that live alongside coral and even some war wrecks. There are areas where soft corals and fans dominate, other areas have incredible hard corals. There are seagrass beds, blue water mangroves, shallow reefs, drop offs, caves, black sand and white sand bottoms. And not to forget the diverse array of fish in more shapes and sizes than anywhere else in the world, ranging from pygmy seahorses to the top predators. The reefs in Raja Ampat will astound you with its colour and life! Manta rays, wobbegong sharks, epaulette sharks and bumphead parrotfish can all be found here in addition to an abundance of macro life. Currents are usually mild around Raja Ampat but a few dives can involve strong currents due to tidal movements so intermediate to advanced dive experience is recommended. 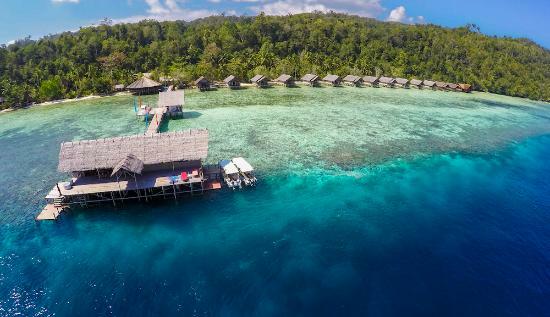 Raja Ampat may be dived from a land-based dive resort concentrating on dive sites in their immediate area or explored by liveaboard allowing a variety of dive sites to be visited. Here you will find some excellent drift dives where white and black tip reef sharks can be regularly seen at depth and you may also spot the odd wobbegong. Sloping soft coral walls are adorned with sea fans. Macro photographers will enjoy the large variety of beautiful nudibranchs, pygmy seahorses, blue-stripe flagtail pipefish and sea dragons. Indian lionfish can also be found here. This wide bay located to the west of Waigeo is considered to be the best place in Raja Ampat to search for critters. At Dinding Seletan you will spot many fire urchins some containing zebra crabs, sea cucumbers with pearl fish, several species of cephalopods such as the blue-ringed, mimic and baby red octopus, cuttlefish and the tiny, rare, iridescent bobtail squid. At Kebung Kerang there are big mushroom leather corals, purple soft corals and huge gorgonians covered in schools of colourful fusiliers and surgeonfish. Has one of the best wall dives in Raja Ampat. Blue Wall drops 30-40 metres into the clear, blue water. The reef wall is a fascinating, colourful mix of hard corals, soft corals and barrel sponges. Schools of yellow-fin barracuda and surgeonfish will encompass your frame whilst black tip and grey reef sharks swim below you. Around the corner is Black Forest hosting black corals with pygmy seahorses. Located in the Dampier Strait, which flows between Waigeo and Batanta islands, lies the area best known for its large concentration of fish life. At Sardines you will see massive schools of wahoo, trevally and tuna as bumphead parrotfish feed on the coral in the current. At Cape Kri you will be surrounded by dogtooth tuna, giant trevally, chevron barracuda, snapper, giant grouper, napoleon wrasse and white tip reef sharks. This scenic group of often photographed limestone islands and islets lies to the west of Batanta island. Here you will find beautiful turquoise bays, lagoons and small coves lined with pretty beaches and cliffs. Some of the best diving can also be enjoyed here. You will be rewarded with sitings of the rare tasselled wobbegong, great barracuda and perhaps manta rays at Batu Burung. This site also attracts several species of the colourful angelfish. Hard coral gardens abound in the shallows where titan triggerfish feed and giant clams have grown to enormous proportions. White and black banded sea snakes may also be spotted hunting over the cabbage patch corals. The area also has it’s share of critters. Located to the south west of Waigeo, between the islands of Mansuar and Airborei, this cleaning station is the most reliable spot in Raja Ampat to see manta rays in large numbers. Between 5-30 mantas regularly come to this shallow site to circle gracefully in the strong current and be cleaned of parasites by the attendant moon wrasse, leopard wrasse, black eye thicklips and cleaner wrasse. Some of the mantas have wing spans of 5 metres and some are completely black on both their top and lower sides. This dive is for advanced divers able to hook into the reef in the strong current. You will be amazed by the variety of dive sites and some of the most beautiful underwater scenery in the southern region of Raja Ampat. To the north west of Misool island lies the famous Blue Water Mangroves where a maze of channels cuts through the mangrove islets surrounding Nampale Island. Here, soft corals are nourished by the oceanic currents and critters hide amongst the tree roots. The reefs around the small islands to the south east of Misool are sure to excite the most seasoned divers. 20km to the east of Misool, is one of the favourite dive areas for its distinctive seascapes of tunnels, caves and brightly coloured coral encrusted walls. Under the overhangs and ledges you will find gardens of soft corals in an array of colours, gorgonian fans hosting various species of pygmy seahorses and whip corals with coral gobies and camouflaged shrimp. Tube sponges and tunicates round off the scenery. Midnight snapper and sweetlips lurk in the tunnels and caves whilst hundred of fusiliers cover the walls. You will also be able to find ornate ghost pipefish, frogfish, hawkfish, the mimic octopus and nudibranchs. Highlights include Goa Besar and Verona’s Garden. The waters surrounding the pinnacles and islands of Fabiacet offers some of the best visibility in Raja Ampat - up to 40 metres - and some excellent fish life. The current running between the islands and islets provides a good place to sit and watch the fish action. Hammerheads have been seen here as well as Napoleon wrasse. Several types of snapper congregate here with big grouper, great and yellow tail barracuda and mackerel. The area is also known for the masses of large pink, red, lilac and purple gorgonian fans and sea fans covering the walls. Cenderawasih Bay is one of the few places in the world where encounters with whale sharks in large groups can be found with such regularity. The whale sharks regularly visit the local fisherman's Fish Platforms to feed off the 'ikan puri' or anchovies that the fishermen catch in their nets. Multiple hour sessions with groups of whale sharks can be expected with an average encounter of 5 whale sharks in one outing. Up to 15 whale sharks have been seen at the one time under the platforms. The behaviour of the whale sharks is quite unique in that not only will they stay with you for a long time (often many hours) but they are far from shy and not scared of flash photography or bubbles from divers. Often you will be approached face to face by the whale shark with only centimetres between you and the shark, making this a truly magnificent experience. Encounters with the whale sharks can be done both on scuba or by snorkel. There is a strict no touch and no chase policy and the number of people allowed in the water with the whale sharks at any one time is limited. Raja Ampat is a perfect destination for liveaboard diving, enabling you to dive some of the best dive sites around Raja Ampat all in the one trip as you cruise from island to island around the immense archipelago. Click here for more information on Raja Ampat liveaboard options.